The next we addressed Health Literacy, which encourages family engagement and preventative wellness checks. Attendees learned that there is a huge Health Disparity and Health Care Disparity among people of color. The most underrepresented peoples include children, older adults, pregnant women and individuals with physical, intellectual, and developmental disabilities. We are also in need of providers who represent the community they serve. The Healthy People 2020 initiative is a collaboration within communities to propel precision medicine and further medical research. You can learn more about this through the “All of Us” Research Program. 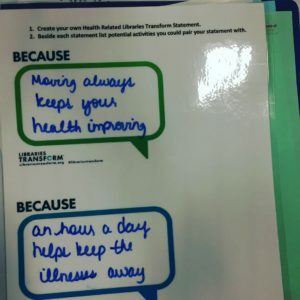 How can libraries employ health literacy outreach? 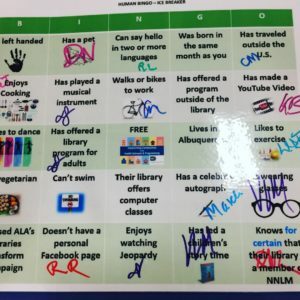 By thinking about the levels of engagement, which include awareness (create displays/distribute publications), activities (host a guest speaker/exhibits), and programs (library staff lead program/bookmobile/book bike). If you feel as overwhelmed as we did, just consider one item with which you can start. We then had a Snowball Activity where we wrote down impediments to enacting these ideas and received helpful tips to overcome them. To ease any stress you may feel, consider partnering with the NNLM! Your regional liaison can provide your library with health information resources, such as a Resource List, online databases, and the magazines they publish. Didn’t know they had one? Neither did we! We also had the opportunity to brainstorm some “Because” statements! Thanks for such an informative preconference ladies! !